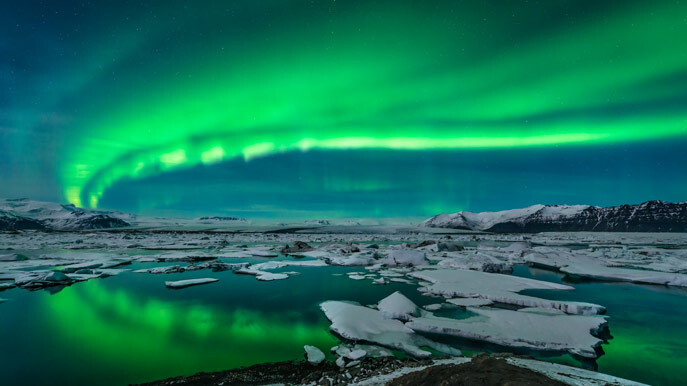 Search for the best flight prices from East Midlands to Reykjavik. Compare prices, book today and save money with East Midlands Airport. The air might be cool, but a decidedly warm welcome awaits visitors to the Icelandic capital of Reykjavik. Amongst the picturesque glaciers and arctic tundra, there’s delicious dishes and spectacular entertainment options to be found in the city. Although the population may be a little thin, with only 200,000 residents, this tiny city adrift in the Atlantic is so much more than a destination. Reykjavik is a place of exciting possibilities where adventures beckon and natural wonders await. There’s an incredible range of accommodations on offer in Reykjavik, including spacious short-term apartment rentals, minimalistic boutique hotels and cosy guesthouses. If you’re looking for the height of luxury, you should consider a stay at the Canopy by Hilton which boasts a modern design that’s sure to wow. Many of the city’s downtown hotels are conveniently located near the main attractions, due to the Reykjavik’s small size, but even if you’re staying out of town you’ll likely be just a quick drive or bus ride away. Considering the size of the city, Reykjavik offers an incredible range of shopping for visitors. If you’re looking for an American-style mall you should head to the excellent Kringlan Shopping Centre or even the main street Laugavegur. Alternatively, you can immerse yourself in the local cuisine and produce by visiting the Kolaportið flea market. If you can only take one souvenir, you need to pick up a distinctive Lopapeysa – an Icelandic knitted jumper – which can be found in most clothes and gift stores in Reykjavik. Foodies are sure to be in their element during a visit to Reykjavik. Local chefs pride themselves on using fresh, Icelandic ingredients whether it’s at a famous hotdog vendor or an innovative fine dining restaurant. The city has lots of quality restaurants, so it’s best to just dive in and try a bit of everything – from the city centre you should be able to easily find everything including classics of Icelandic cuisine and international dishes from India, Nepal, Mexico, Spain, China, Japan and Italy. Celebrating winter and the emergence of light after the darkness of the year’s end, Reykjavik’s Winter Lights festival sees the city come to life with a host of events – including late-night museum shows, poetry readings and live music. This annual gathering has been celebrated every year since 1944 and is a chance for street parades, live music and theatrical performances, as well as a wealth of associated side shows and dances. A chance to make the most of the longest nights of the Icelandic midsummer, the Midnight Sun Run sees Iceland’s joggers take to the streets of Reykjavik at midnight. It’s an incredible occasion that brings most of the country together as everyone watches the half-marathon, 5K and 10K. Reykjavik’s annual culture night (which actually starts in the day) serves up a rich programme of tours, shows, exhibitions and concerts. It’s the perfect opportunity to join thousands of locals in wandering the streets and visiting a myriad of the city’s top venues. Iceland Airwaves has drawn plenty of big rock and dance artists over the years, as well as local musicians such as Sigur Rós and Björk – which has established it as a fixture on the international music scene.